The Ledger Card is where the history of charges, credits, payments with the balance for each family and/or agency is recorded. Often you’ll use special tools like Automated Billing, the Late Payment Calculator or Quick Ledger Posting to record information on many ledger cards at once. However, it’s good to know how to make individual entries as needed. Confirm your ledger posting date ranges are set correctly to allow posting to prior or future periods as needed in the Family Accounting section of Region and School Configuration. Look Up the account and click the Ledger icon on the account toolbar. If you are just getting started with Ledger Cards, you’ll want to begin by posting beginning balances for each family. See: How to Post Beginning Balances. Select a Description like “Tuition Toddlers”, “Family Discount” or “Pmt by Check” as appropriate. Today’s Date will be automatically entered. Change the date if needed. Type a Comment (optional) like the check number when a payment is made. Confirm the Amount or type it in as needed. Note: The Amount will be entered automatically if the selected Description has a Standard Amount. When recording a payment the full amount due appears by default. In either case you may type over the amount as needed. To continue adding additional items tap Enter (on your keyboard) until a new, blank line appears. Click once on a line to select it. Select a Void Date and enter a Comment if needed. At the Account Ledger screen click Post & Exit. Note: To see who voided an item (as well as the date & comment) just go to the Ledger Card, click once on the line to select it, then click the Void button. The User Group to which you are assigned determines whether you can make changes to a Ledger Card. In most cases it’s best to void items that were posted incorrectly rather than just changing them. Note: To change the void date of an item previously voided go to the Ledger Card, click once on the line to select it, then click the Void button. Change the Void Date or Comment as needed. 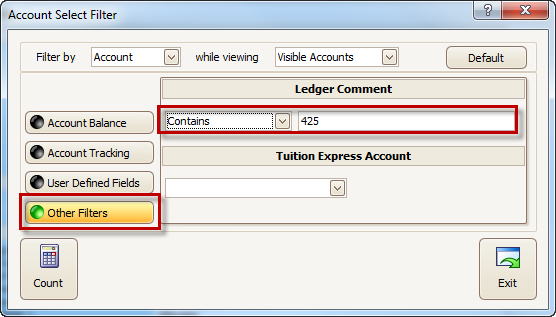 You may use the Account Filter to select only families that have a particular item (like a check number) in the Comment box on their Ledger Card. Click the Filter icon on the account list (looks like a funnel or coffee filter). Choose to filter by Account. Type the text for which you are looking, such as the check number.